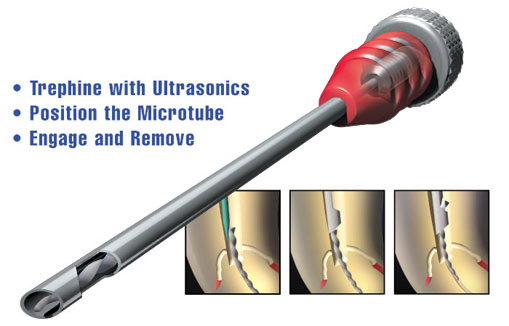 Ultrasonics remains the procedural choice when removing intracanal obstructions lodged deep within the root canal system. On occasion, ultrasonic trephining procedures are limited or prove ineffective. In these instances, the File Removal System (FRS) may be utilized to mechanically engage and potentially remove intracanal obstructions, such as silver points, carrier-based obturators or broken file segments. 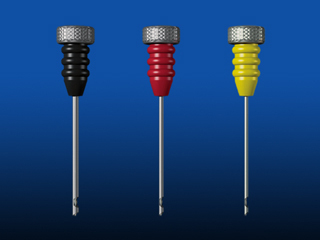 The instrument with the black handle is designed to work in the coronal one-third of larger canals, whereas the red and yellow (product pending) instruments can be placed progressively deeper into smaller, more narrow canals. 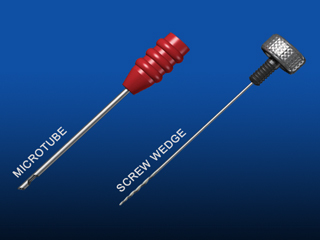 Each complete instrument is comprised of a color coordinated microtube and screw wedge. The microtube’s distal end contains a bevel and side window. The beveled end "scoops-up" the broken instrument into its lumen, and its side window potentially receives the head of the obstruction. The screw wedge is passed through the proximal end of the microtube and, upon contacting the broken instrument, is turned CCW to mechanically engage the obstruction. When engaged, the obstruction is removed by rotating the microtube and screw wedge assembly out of the canal. Note the black and red screw wedges may be interchanged between each microtube which, at times, improves mechanics.